SGS is Neutral (as of close of 11/9) and RTS is in cash (as of open of 11/10). Market has just too much to digest, China, Europe, tax cuts, possible financial Wikileaks, etc. 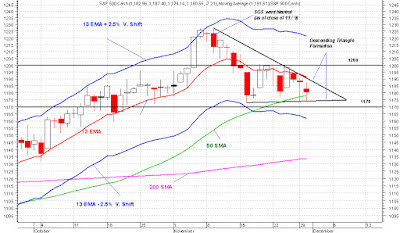 SPX is range bound between 1200 and 1170, give or take a few points. 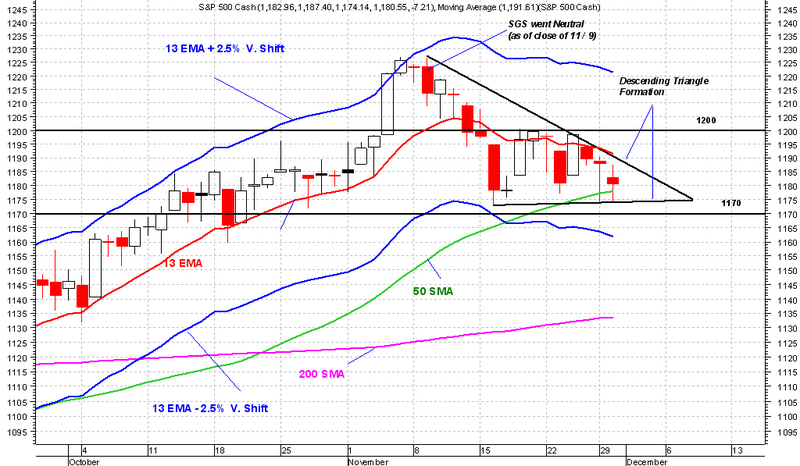 There is also a looming descending triangle formation with a possible objective at or near 200D SMA. I still think that chances are good for a Santa rally to test Nov. high and beyond sometime this year, but it's best to let Market make up her mind and set a course for us to follow. A solid and heavy close above SPX 1200 would be the trigger to go long and a solid and heavy close below 1170 would be the trigger to go short. I'm looking for SPX to close above 1200 sometime this week.